5 min read . Updated: 15 Dec 2007, 12:01 AM IST Landon Thomas Jr. Stuck in a traffic jam in his bulletproof BMW, the richest man in Turkey lets loose with a satisfied grin. Since 2000, Husnu M. Ozyegin has spent more than $50 million (Rs197 crore) of his own money, building 36 primary schools and girls' dormitories in the poorest parts of Turkey. Next to the Turkish government, Ozyegin is the biggest individual supporter of schools in the country—and an official from the education ministry has told him that his market share is increasing. “Not bad," he says in his gruff, cigarette-scarred voice as he pockets his mobile phone. “If I can have an impact on 1 million Turkish people in the next 10 years, I will be happy." While such countries have long been accustomed to vast disparities between a tiny class of the wealthy elite and the impoverished masses, the new elite shares some characteristics with counterparts in the US. And just as Rockefellers, Carnegies and Morgans once used philanthropy to soothe the rough edges of their cutthroat business reputations—as have a current generation of wealthy Americans that includes Bill Gates of Microsoft Corp. and Sanford I. Weill of Citigroup Inc.—local billionaires in emerging markets are trying to do the same. Carlos Slim Helu, the telecommunications entrepreneur in Mexico who is worth more than $50 billion, has pledged billions of dollars to his two foundations that will aid health and education. Roman Abramovich, Russia's richest man, who has a net worth of $18 billion, has channeled more than $1 billion into the impoverished Arctic area of Chukotka, where he also serves as governor, building schools and hospitals. And in India, Azim Premji, the chairman of the software company Wipro Ltd who is worth $17 billion, has established his own foundation that supports elementary education. To be sure, as these fortunes are still being made, the sums donated are relatively small in light of the pressing social needs of these countries. But as return-driven philanthropy has gained in popularity through the efforts of Gates and others, emerging market billionaires are applying similar profit oriented lessons to their own countries. “What we are seeing in these countries," said Jane Wales, president of the Global Philanthropy Forum, “are people emerging from the private sector with tremendous wealth who are attracted to highly strategic philanthropy." Here in Turkey, Ozyegin, who is 62 and has a net worth of $3.5 billion, did not secure his wealth by buying government assets on the cheap or by belonging to a rich family that controls a monopoly—two traditional routes to great wealth in the developing world. The founder of a mid-tier corporate bank called Finansbank, he cashed in on a rush of interest by foreign financial institutions in Turkish banks last year and sold a controlling stake in his bank to the National Bank of Greece, receiving $2.7 billion in cash. 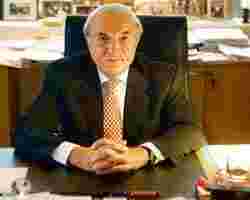 Sitting in his personal conference room atop Finansbank's main office in Istanbul, Ozyegin recalls 18 August 2006, when the sale of his 49% stake officially closed. “I remember that day better than my birthday," he said, as he leaned back in a plush leather chair. “I was not only a billionaire but the richest man in Turkey. It's a great feeling, but your responsibilities increase." Like many self-made billionaires, Ozyegin has a direct, demanding manner, and a day spent travelling with him does not yield much casual conversation. He carries two cell phones. Throughout a long day, he juggles calls from his wife, his assistant, his son and assorted government bureaucrats, as well as the managers of his various businesses. He works 11-hour days, not solely from his suite of offices but also from his car, plane or boat, checking in on his operations in Turkey as well as Russia, Romania and China. “I'm first generation, that gives me satisfaction," he said. "Getting to the top is not so easy; staying there is more difficult." Ozyegin's grandparents came to the southern Turkish city of Izmir from the Greek island of Crete in the late 19th century, during the dying days of the Ottoman Empire. The son of a doctor, he attended Robert College, an elite academy in Istanbul, before setting off to Oregon State University in 1963 with $1,000 in his pocket. An overachiever, he played basketball and led the student government, but earned mediocre grades. Harvard Business School seemed like a long shot given that he was in need of a scholarship. But he attached a picture of himself welcoming Robert F. Kennedy to Oregon State to his application and was accepted. “I guess they liked me for my leadership abilities," he said. At the outset, the bank's ambitions were small, providing corporate banking services to Turkish businesses. The bank's fortunes fluctuated in line with the volatile economy, expanding rapidly during the heady years of strong economic growth, but facing extinction on two separate occasions, in 1994 and 2001, when the Turkish markets suffered contractions. As a businessman, his frequent interaction with South-East Asia, China and Russia has impressed upon him the need for Turks to become more competitive in today's global economy. “The most important problem that Turkey has is education," he said. He cites the rapid increase of applications to Harvard Business School from Chinese and Indian students. Turkey, a smaller country, sends only four to eight students a year, said Ozyegin, who meets with the students when he visits. Beyond his public school investments, Ozyegin has plans to spend up to $1 billion over the next 15 years on a new private university, to be called Ozyegin University. “I want to do something on a major scale," he said. "My vision is that we can train and export people like India does." Since he started his building programme in 2000, Ozyegin has completed 36 schools and girls' dormitories at a cost that varies from $400,000 to $1.8 million each. He wants to reach 100 by 2010. He works closely with the government, with most of the building taking place in the country's poorest regions in the south and northeast. “That is a lot, it is a very significant number," said Filiz Bikmen, the executive director of Tusev, a philanthropy foundation in Istanbul. Turkey has the lowest ratio of girls to boys in primary and secondary school of any country in the Organization for Economic Cooperation and Development, which requires its 30 members to meet minimum requirements for living standards and democratic practices. it's low standing is a result of a traditional culture that, especially in poorer areas, places a higher premium on a boy's education than a girl's.